For now---- what is the proper icon for Contacts in ios11?? 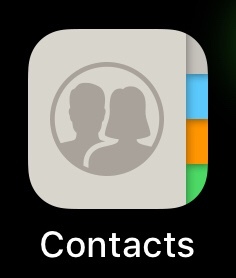 I’m not sure what being hacked has to do with the Contacts icon but here it is on my home screen (iOS 11.2 developer beta). Restore your phone in iTunes and set it up as a new phone. Change your AppleID password. IF you were hacked, it’s your account and not your phone. “Many problems” would be resolved with the restore. How do you know you've been "hacked"? Can you offer more info? Just_Me_D and Avery Murray like this. Many problem? Can you be a bit more specific in regard to the ‘many problems’ you are referring to?